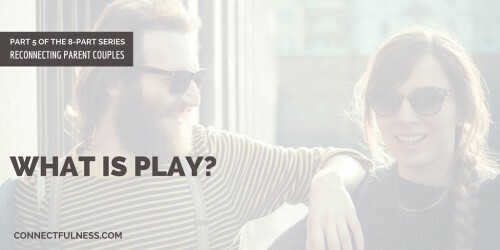 PART 5 | WHAT IS PLAY? An 8-part blog series, helping parent couples reconnect. A note on the Reconnecting Parent Couples Series: These eight posts present perspectives and advice from respected colleagues and experts from across the world. I’ll also weave in my personal and professional discoveries and introduce you to aspects of my evolving relationship practice: Connectfulness. When it is incorporated into your daily rhythm, play can fundamentally shift everything about how you and the people you love relate to one another...I find that’s especially important for parenting couples to keep in mind. So what gives? Why does the word and concept of play totally stress people out? Perhaps you are unsure about what play looks like. Well, duh! But that doesn’t exactly help you start adding more play into the connections that fuel your daily life, does it? Play can be hard to define. It can include so much. Humor, flirtation, games, roughhousing, storytelling, fantasizing, collecting, movement, exploring, competing, directing, creating. Play is a natural and biologically driven social exploration. It helps you learn about, and experience your world and your relationships by encouraging discovery.and feeding curiosity. Play is inhibited and shuts down when you don’t feel safe (In my practice, when my clients can’t or aren’t playing in their relationships I want to know more about what doesn’t feel safe. And we slowly begin our exploration there). Play allows you to practice essential life and relational skills. It is full of triumphs and failures and everything in between. Play is magical, integrative, and healing. It allows you to process, digest, and gain understanding about your life and your relationships. And perhaps most importantly, play happens in your mind. In fact, recent findings in neuroscience are showing that nothing lights up our brains like play does. Why do we need to play? We adult humans keep forgetting about the purpose of play, or we simply don’t value play. I get that, it’s so easy to do. When you are in the flow of play, it feels totally purposeless. And part of being a grown up is to have a clear sense of purpose, right? We push children of all ages to play less & sit more. We are placing value on decoding and recall rather than comprehension and collaboration. Children are missing out on the experiential learning that they can only absorb through the process of play. Play is very much a pre-programed social mammalian skill. Watch a pack of puppies, or a litter of kittens. How do they interact with one another and learn appropriate social behaviors? They wrestle with one another, they push and pull on boundaries and they either get redirected by one another or mamma when they’ve gone too far or they tire out in a happy exhausted pile, content with one another. And it’s not different for us humans. We learn how to connect in play. Your sense of safety and trust in relationship are established through play signals such as eye-contact, facial expression, voice tone, posture, gesturing, timing and intensity of response. In play, it's safe to fail, to fall get up and try again. Play makes it easier to adapt and stay connected. If you want to do more than merely survive in your relationships, you need to play. Couples who thrive know how to play. When you start to make play your mindset — the attitude you use to approach life situations — you get to practice how you perceive and respond to other's emotional states in a safe, no pressure way. Play is the glue that connects people to one another. In my next post we’ll dive deeper into how you can rediscover play if you’ve lost it, stay tuned! Sign up for my Connectfulness Newsletter and you’ll receive future posts directly in your inbox! And please share the love by sharing it with the people you love.